Ulster scrumhalf John Cooney will make his full Ireland debut against USA on Saturday. Having had some cameo performances off the bench, head coach Schmidt has handed him a long awaited start against the currently unbeaten North Americans. He is partnered with Joey Carberry in the half back positions. Tadhg Beirne has a chance to kick-start his Test career also winning selection in a much-changed Ireland team from that which defeated New Zeawland last week. Garry Ringrose is the sole survivor from that stunning 16-9 win over New Zealand, Schmidt making 14 changes for the USA’s visit to Dublin. Toner excelled in Ireland’s first-ever victory over New Zealand on home soil though, to reassert his status as starting lock, alongside the ever-imperious Leinster youngster James Ryan. Head coach Schmidt confirmed he had always planned to make wholesale changes for the USA clash, then hailed lock Beirne’s swift progress in the Ireland set-up. 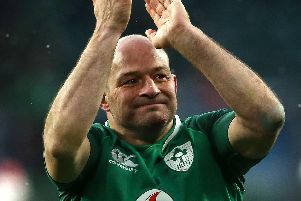 “This was always part of the plan to make the changes, the two games book-ended the series and it’s a chance to look at all of the 43 players across the four matches,” said Ireland boss Schmidt. “Tadhg (Beirne) has slotted in so well, coming off the bench a couple of times in Australia in the summer, and bedding in as part of the broader squad. “And I thought Iain Henderson came on and did really well last week against New Zealand.